After finding Sushi Bong was closed, I stumbled onto their neighbor, Yummy Dumpling House, located at the same North York condo building base. Yummy’s cozy dining room only holds fifteen at capacity, but this doesn’t seem to be a problem as the restaurant wasn’t overly busy during our Sunday lunch. It did have a steady stream of a couple tables coming and going, which is good as the kitchen is a one-woman operation (another wraps dumplings while a gentlemen greets and serves). We’re given small dishes, which I assumed were for holding a dipping sauce, but turns out is also the plate for eating. As the steaming Chinese cabbage and pork dumplings ($8.50 for 15) arrives, the first dumpling, slippery with water, was a bit difficult to maneuver without any real dishware or spoon. Nevertheless, I was eventually successful and took a bite of the scalding dough. 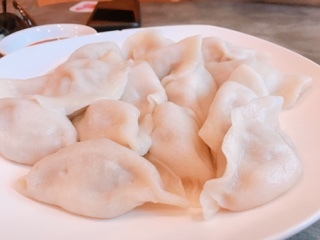 Personally, I prefer dumplings steamed (the wrapper is thinner and hence results in more juices and flavour), but for being boiled these were decent – the wrapper still on the thick side but the filling incorporated enough ginger and spices to stand out. 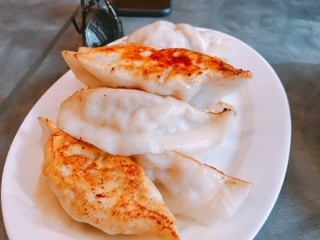 Eat the pan-fried pork dumplings ($7.98 for 8) while they’re hot, as the thin layer of crispy caramelization on the wrapper is delicious. After a while, with the condensation and being piled onto a small plate, they start to get soggy. Some of the wrappers did break so the juices (one of the best parts of the dumpling) escaped. But, the couple of intact ones I had were tasty - Yummy Dumpling House really gets the seasoning right. 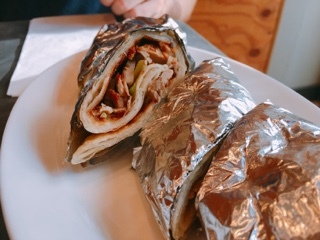 If you like Peking duck, give their flavoured pork wrap ($5.98) a try. 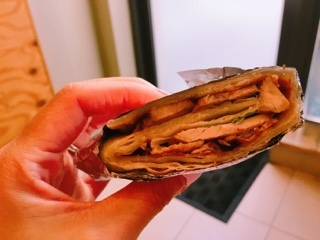 The wrapper is thicker but has that same chewiness as the Peking duck counterpart. Lightly toasted with crispy edges, it holds thin slices of roasted pork covered with sweet hoisin sauce and fresh scallions. In the end, it has a Peking duck essence but isn’t oily and much heartier. The experience reminds me of the need to just get out and explore restaurants. I’m guilty of it: relying on reviews or Instagram pictures to decide on where to eat. However, this limits the opportunities of stumbling across little hole-in-the-wall places where you can support mom-and-pop establishments that can’t afford media events. So set a date and grab someone to just take a stroll; find a small place that you’ve never heard of and just walk in. It may not be perfect, but at least you’ve supported a budding local entrepreneur.